Beat the yogurt in a bowl with a whisk. Scoop the yogurt into parfait glasses and add 4 slices of apple per glass. Drizzle with honey and decorate with a walnut. Serve and enjoy! You can use fruits like pineapple, peach or papaya instead of Fuji apple. If you use canned fruit, try to pick out those that are low in sugar. With the busy lives we lead, it's easy to forget how important breakfast is. Many of my friends tell me it's difficult to find simple breakfast options that are also low in calories. I find that breakfast doesn't necessarily have to include eggs or bread. An excellent substitute is Greek yogurt with seasonal fresh fruit or preserved fruits. 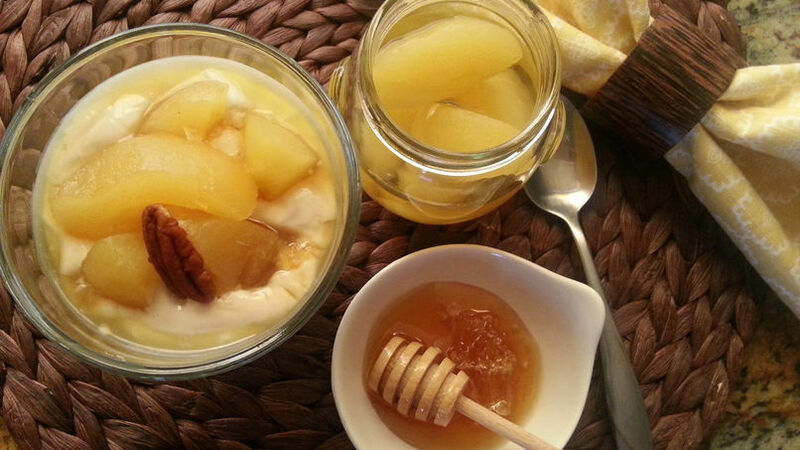 Today I'm sharing with you my recipe for a Fuji apple parfait, a quick, easy and wholesome breakfast that's also low in calories to help you start your day on the right foot. Enjoy!